Are you an animal lover? because if you are, then this game is perfect for you. This game, Pandamania is going to take players on a wild journey and an exciting adventure to the Pandamania park, which is a park that is dedicated to the beautiful white and black pandas. Players will go to that park to play and see the pandas as well as search for its hidden fortunes and treasures. They will also notice from the symbols and the visuals of the game that the Panda has escaped and is also out on its own in search for fortunes and treasures. So players will join the panda so they can enjoy a great ride and split the loot. PandaMania Casino Slots has 5 spinning reels and offers players a total of twenty-five bet lines that they can place their desired stakes upon. 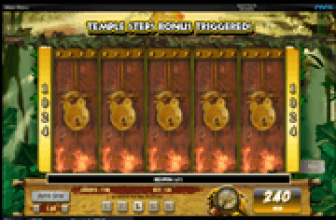 These stakes can be placed under the reels as players go through the game’s betting options that include the number of lines as well as the value of the used slot coins. Players will then click on the Play button to initiate the game and start enjoying the experience that the video slot has to offer. The game’s visuals and symbols as well as sound effects, all combine together to create the environment of Pandamania in order to provide players with an ultra-immersive gaming experience that they can’t find anywhere else, which is not really a surprise since the game is powered by none other than Next Gen Gaming. For starters, players will see that the 5 reels of the game itself are located inside of Pandamania which beautiful green areas around it, the panda’s cage and a mesmerizing waterfall. As for the symbols that will start spinning on the game’s reels and lines, they include the park’s guard, the panda, the zoo park tickets, the Pandamania wooden sign, a hotdog stand, and a gifts stand as well as beautifully colored card symbols. These colored symbols represent the low paying icons of the game. 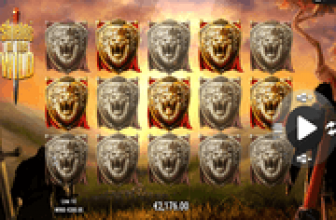 As for the highest paying icon of the slot, it is the Wild Panda as players who manage to get 5 of these symbols on the same payline will get to earn a huge payout of 3000 coins. The Panda is not just the highest paying icon, as it can also replace other standard icons on the game’s lines in order for players to have a higher chance of forming a winning combo so they can claim their prize. All wins with the help of the panda are doubled. It will not replace the scatter bonus symbol or the pick me bonus symbol. The pick me bonus symbol can give players the chance to earn instant prizes when it lands on the 2nd and the 4th reel at the same time. The scatter sign can trigger 10 free games on the slot when 3 of them land on the reels. With 5 reels and 25 paylines, there are a ton of ways to make money playing PandaMania Casino Slots. Search for hidden treasures and bonuses in the park while earning points towards free spins and games. Try it out!